The all new FAST Start™ Big Wheel® Wean-to-Finish Feeder is a one-of-a-kind pig feeder fully capable of starting pigs immediately after weaning with no labor, no adjusting, and no waste. Thoroughly tested and endorsed by numerous independent producers, the FAST Start Big Wheel provides fast, easy starting of weaned pigs and efficient, waste-free finishing for market animals. 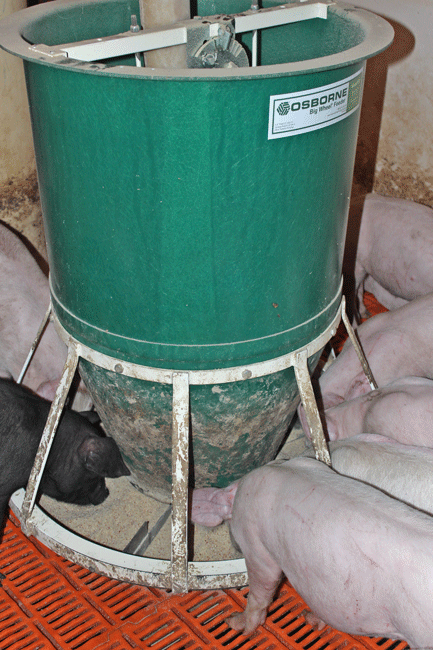 For nearly 30 years, producers have known that Osborne Big Wheel Feeders are the most efficient pig feeders ever made. Their unique, mechanical flow design maximizes feed savings. The all new FAST Start Big Wheel features all the no-waste, feed saving aspects of the Big Wheel family of mechanical-flow feeders, but operates in gravity-flow mode for newly weaned pigs. 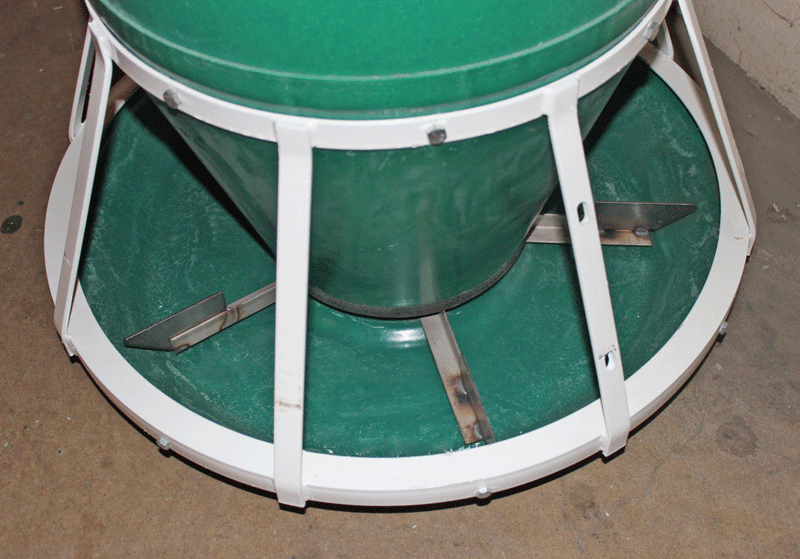 Feed Hopper Bottom: Specially designed closure slides remain in the open position for gravity-flow feeding until pigs can turn the feed wheel, automatically closing them to convert to mechanical-flow. 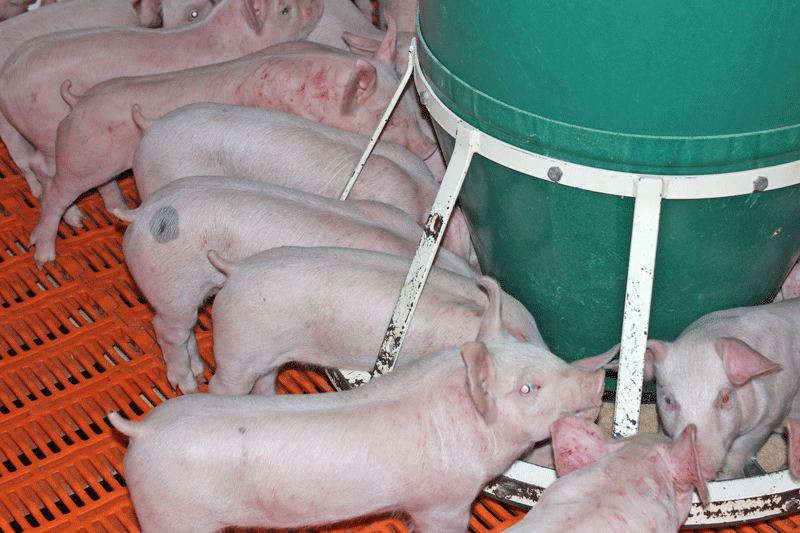 Trough: Round, self-cleaning trough is engineered for all pigs from weaning to finishing. No corners or crevasses for feed to accumulate and become stale which is important to sensitive, newly-weaned pigs. Feed Wheel: A five-spoke feed wheel agitates and continually mixes feed, keeping feed fresh and palatable. Pigs quickly learn, through play, that turning the wheel always delivers fresh feed. Feed Sweep: In mechanical-mode, a feed sweep, connected to the wheel, sweeps feed out of the hopper through a small opening in the hopper bottom where it is distributed into the trough. 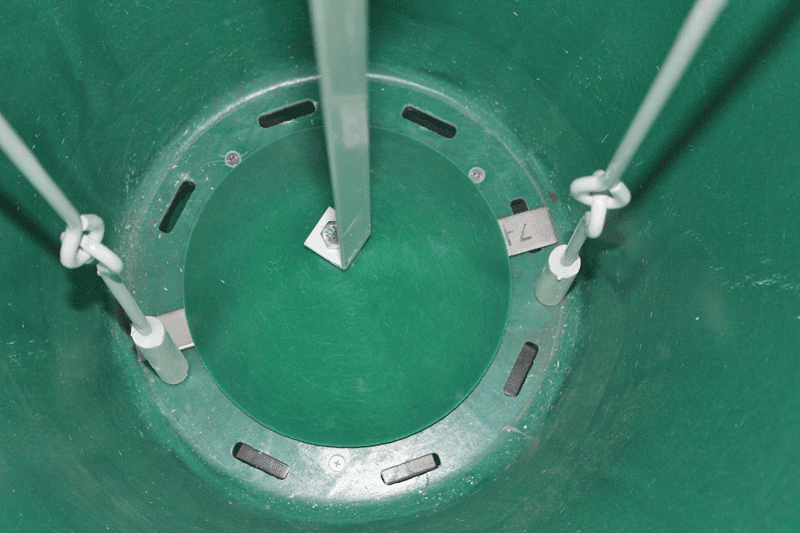 Feed Cone: The feed cone directs the weight of the feed in the hopper off of the sweep, allowing weaned pigs to begin turning the wheel within 10 to 14 days. When weaned pigs are put on the feeder, the slides on the feed hopper bottom (1) are open, allowing feed to freely flow into the trough (2). As pigs grow, they begin turning the multi-spoke feed wheel (3) in the bottom of the trough, which closes the slides on the feed hopper bottom. The feed sweep (4), located in the bottom of the feed hopper and attached to the feed wheel, sweeps feed past the cone (5) and out of the hopper to the trough. Feed falls through the center hole into the trough, where the feed wheel dispenses it to the pigs. 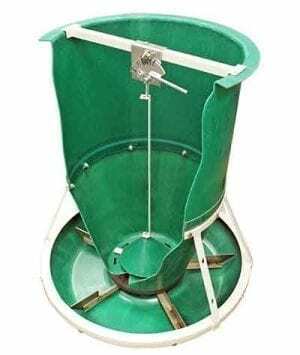 Once pigs are able to turn the feed wheel, the feeder makes its automatic conversion from gravity to mechanical flow. 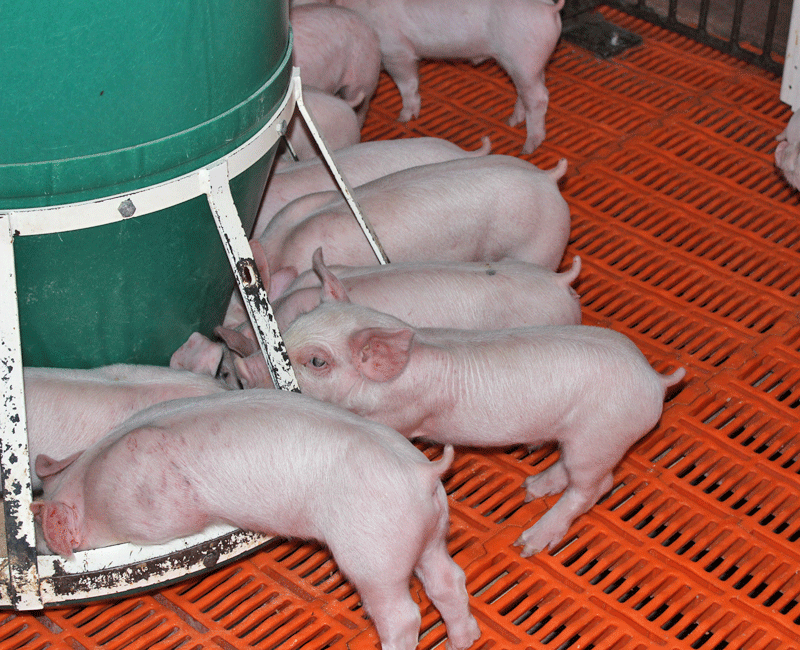 Start Pigs Immediately – The gravity-to-mechanical design provides newly weaned pigs access to fresh feed, even before the feeder’s agitation wheel is activated. 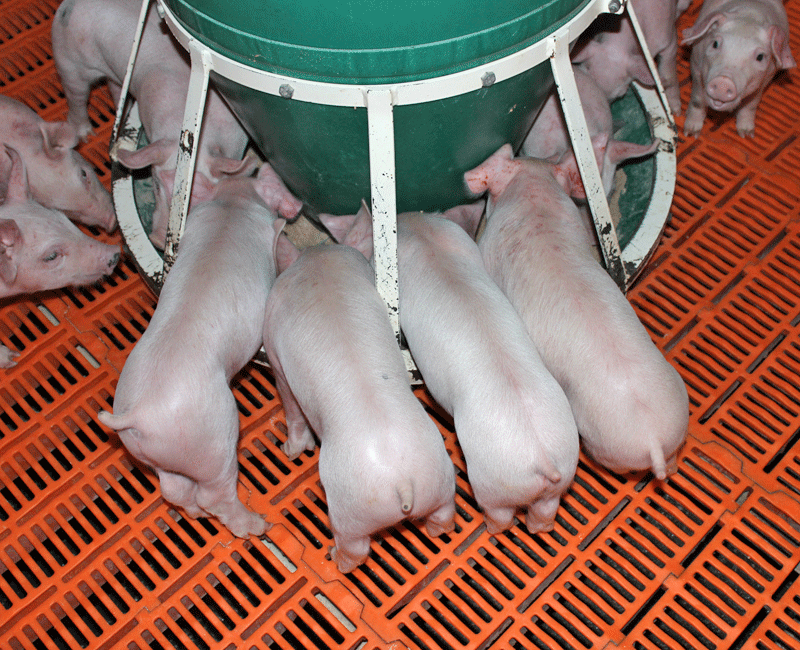 Once pigs are able to turn the wheel, the feeder automatically converts from gravity to mechanical flow. Absolutely no human intervention is needed to start pigs on the FAST Start Big Wheel. Always Fresh Feed… Automatically – At the start of a turn, weaned pigs receive the full benefits of gravity-flow feeding, keeping maximum feed in the trough. As they grow, the automatic conversion from gravity-to-mechanical feed flow maximizes feed savings. The self-cleaning, round trough has no corners for feed to accumulate and the spinning action of the wheel keeps feed fresh and palatable. Completely Eliminate Waste – Unlike conventional gravity-flow feeders, mechanical-flow feeders are proven to save more feed than any other feeder type. Once pigs turn the feed wheel, the FAST Start Big Wheel automatically converts to mechanical-flow, eliminating play-waste. Once in mechanical-mode and pigs stop eating, the feeder stops feeding. Round Access Means Better Performance – Osborne’s Big Wheel spreads animals radially, providing more standing-room and less physical contact, which often results in wasteful competition. Conventional rectangular feeders force pigs into close contact. Linear trough space is never fully used, and pen space is always less for a Big Wheel.